Stop the dole for people in locations where jobs are available and recipients are failing to apply for them, says MLA for Namatjira, Alison Anderson (pictured). What’s more, the NT Government should be playing an active role finding productive uses for the vast real estate owned by Indigenous people, exploring and developing opportunities for joint ventures. The Territory’s southern-most electorate is 351,294 km² – bigger than Italy. Some 60% of the land is Aboriginal owned, under “inalienable freehold” provisions of the Land Rights Act. These lands can be leased. 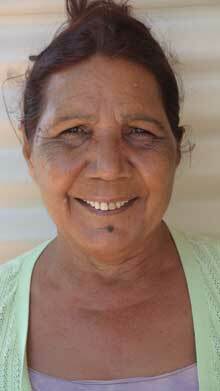 Most of Namatjira’s population is Indigenous and unemployment is endemic. Ms Anderson has named six locations where the policy could be implemented immediately throughout the NT: Ayers Rock Resort, Granites gold mine in the Tanami, the Hayes family’s Rocky Hill vineyard south east of Alice Springs, the watermelon plantation at Ali Curung near Tennant Creek, the Gove alumina plant and the Groote Eyland manganese mine. “This is where we need to start,” says Ms Anderson. “My side of politics has said many times that we need to cut people off welfare where real jobs exist in real places. “The time has come to start doing this instead of churning out the same old nonsense”. She says with conservative governments nationally and in the NT, the opportunities have never been greater. In an extension of the initiative, NT government departments should be examining opportunities for joint ventures between local land owners and outside companies in agriculture, horticulture and tourism: Aboriginal land owners could contribute land, water and currently idle labour, and bring in capital and expertise. Ms Anderson says the NT Government would need to look at issues such as suitability of soil, availability of water, and number of workers currently on the dole. Meanwhile Ms Anderson says the NT Government is giving work to interstate companies while local operators are missing out. One example is Tourism NT having interstate companies producing its latest TV commercial instead of engaging locals such as photographer Steve Strike, cameraman Chris Tangey and computer artists Sprout Creative. I firmly agree, Alison. The leadership must come from within too, as you are doing. It won’t be easy as there are many people who will cave in to each and every excuse to stay with the status quo. Well done. I wish you all the best. Change will not be perfect (unlike the lefties). Very few local indigenous people work at Ayers Rock resort. All of the trainees come from interstate. The locals get to do fabulous work like cleaning toilets and making beds … hardly anything to aspire to for a long term ‘career’! @ Bush Teacher. October 14. Yes, these are some of the realities. Moving from Ali Curung into Tennant will still incur housing issues and employment responsibilities for those who are welfare registered, whether cultivating watermelons or whatever the local job market can offer. Mobility is a fact of Indigenous life. “You can’t change the rhythmn of my soul …” is more of a protest at having to be put into the boxed set of Western options, most of which are institutionalised at various levels. Issues of being on time for work and illness are highly credible. Issues of low productivity accord with the nature of the job, but cultural leave is the most impressive reservation. The combination of Western and Indigenous cultures in Central Australia has produced some lamentable results and the history is well-known. This is the most difficult area to resolve because there are differing belief and value systems operating. The imperative of financial exchange for labour in the modern economy is the salient factor. Past policy and ingrained habits have produced strongly held lifestyle outcomes and they won’t be easily broken. Small steps towards realisable goals with an accompanying overhaul of the welfare system may be a place to start, but the NT government’s intransigence with seven days per week takeaway alcohol policy has made me cynical of any lasting change in the status quo. I agree that creating a culture of work among youth should be our top priority. It isn’t a simple and straightforward task, but developing our local human resources is our best investment. This is definitely worth a go with the following in mind: People will move away from area where work is available, for example there will be a flood of people moving into Tennant Creek from Ali Curung. Forcing people to work doesn’t mean you get workers. They will almost never be on time for work, they will frequently claim illness and some will be genuine. Claims for cultural leave will be vast and ever increasing. Getting them to perform work will take a lot of close supervision so productivity will be very low, employers may soon wish they were not employing them and will dismiss most – so back to square one. Training will have little impact on work performance and retention. These are the realities but we have to start somewhere. Great to read that action rather than words are required here. What Alison is suggesting makes absolute sense for people in areas where employment is available. It’s not only ‘her side’ that supports this. Joint partnerships are always a great possibility helping to build ‘whole-of-community’ productivity, self-esteem and growth. As for employing local companies, does Tourism NT tender these roles or are appointments made (and under what criteria)?